From the site of the Bushwick Inlet surrounds a seeming opposition of historic brick clad buildings and new glass encased high towers coexist with little effort. Using the client’s, the People’s Firehouse, intent to reestablish firehouse 212 and the historical ties a units had to its community the new building’s design needed to connect history with modern firefighting conventions. The apparatus bay, being of the public’s largest interest in fire stations, faces the Bushwick Inlet Park. By situating it between the public Monitor Museum and the private firehouse, the apparatus bay intertwines the two social settings. The museum lines the northern street to pull attention from the southern park and commuters, while the formerly segregated fire house sits further within the park for proximity to the water’s edge for shore fire rescues and to engage the community as pedestrians cross between the building and its dock. The form frames the existing corner created by intersecting streets to act as an intermediary between the park and urban conditions. This wedged shape visually draws attention inwards to explore the history and practices of this particular site. From the building complex, the views open towards the park, inlet, river, and Manhattan skyline to further bridge environmental interior and exterior qualities and the people experiencing them. 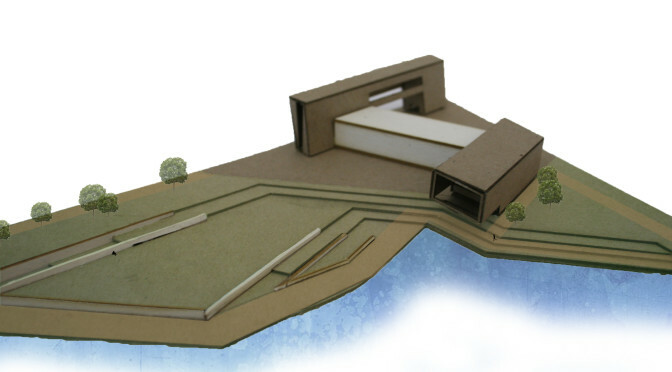 The existing boundaries that informed the building’s design are extusing retaining walls. These walls designate three separate areas united by a singular pathway; each treated individually to allow for multiple uses from a secluded shelter using trees, open freely sloping land for large events or games, to a strict stepping condition for plays or lectures. Using the complex as a transitional space between urban contexts relates to the backdrop of ongoing evolution of the cityscape. The connection is further anchored to the site by the apparatus bay’s intervention between private and public spaces to reintroduce the community to the historical relevance they had on fire station 212.